This is the story of how I was hit by an explosion, and came out of it alive, with nothing more than some second degree burns. It was Thursday afternoon, and my co-workers and I were carrying out a switching procedure to bring a substation online. (Warning: I'm about to get all technical and boring, so skip this paragraph if your eyes start to glaze over.) The purpose of the substation was to step down the voltage from our transmission line (over 100,000 Volts) down to distribution voltage (about 12,000 Volts) and send power out of the substation to different via circuits called feeders. The building is full of circuit breakers in large metal cabinets. There is a main breaker, which can allow or stop the power coming in from the transformer, and several feeder breakers. They function kind of like the breaker box in your house, but everything is much bigger (each circuit breaker is roughly the size of an outdoor air conditioner). Anyway, the substation had been down while some contractors were installing new equipment. I was in charge of coordinating the project, so I was present for the switching procedure to make sure the new equipment functioned properly. Our electricians, the dispatcher, and some linemen out in the field had completed several steps of the procedure. We had closed the main breaker and one of the feeder breakers, so there were now several hundred amps flowing through the substation. I verified that the equipment was working, and the procedure continued. The electricians (we'll call them Steve and Ken) and I were standing inside the building, a couple feet away from the main breaker's cabinet. The cabinet door blew open, and I felt a rush of heat. I found out later that the door had hit Steve and knocked him to the floor. A second or two after the explosion (or maybe a fraction of a second), I decided I shouldn't be standing in front of the cabinet, so I dove to the right and hit the floor. There was black smoke billowing out of the cabinet, and I saw some sparks. I could also see Steve, Ken, and the contractors running out the substation door on the other side of the cabinet from me. I got to my feet and ran out the other door. "My clothes might be on fire," I thought, so I threw off my Boba Fett jacket, and started to unbutton my shirt. Then I noticed my hands. They were completely black, and I felt a growing sense of pain. Steve ran over to me, and asked if I was all right. He told one of the contractors to call an ambulance. My hands were getting more and more painful, and my fingers were starting to contort. My face felt hot, too, but the pain in my hands was ship overwhelming that none of the other parts of my body seemed to bother me. While Steve got me a chair, Ken came to stand by me. "Someone call my wife," I said. I gave Steve the number, and he let her know I had been in an explosion, but I was standing and talking still. The linemen rushed to the substation as soon as they heard what happened, and they made sure I stayed sitting, and that someone would be with me at all times. Then the police showed up and asked what had happened. Finally, I heard the glorious sound of an ambulance siren, and a pair of EMTs evaluated me and got me onto a gurney and into the ambulance. During my ride to the hospital, they cut my clothes off and hooked me up to an IV. Then they were able to inject me with some pain medication. When we got to the hospital, they wheeled me into the emergency room and took a look at my burns. My face and hands had first and second degree burns. The blast had burned through my shirt and left a first degree burn on my abdomen. And the pain on my knee - which I had assumed was a scrape from my too-little-too-late dive - was actually another second degree burn. They put some antibiotic ointment and gauze over my wounds, which brought my pain level down to zero, and after a few hours I had been transferred to a hospital room. By noon the next day, I was heading out the door. As you can probably imagine, my first thoughts were, "Holy crap! What the [expletive] is happening?" But once I got outside, and had a minute to process things, I had a sudden sense of amazement and gratitude. "I'm standing up... I'm breathing... I'm alive! My hands hurt like crazy, but that could have been so much worse. My guardian angel was definitely looking out for me." So while I waited for the ambulance, I wasn't anxious because I thought I was dying; I just wanted someone to make the pain in my hands go away. As I lay on the gurney in the ambulance, I reflected that my hands looked like Doctor Strange. "Maybe I'll get cool magical powers," I joked. Throughout the ambulance ride and the procedures in the emergency room, most of my thoughts were similarly lighthearted. I had a sense of peace, that everything would turn out all right. So I cracked jokes, and made sure I told the EMTs, nurses, and doctors what a great job they were doing. 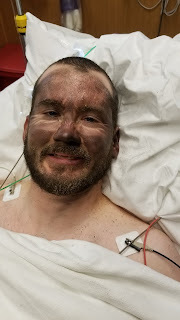 When Jess arrived at the ER, I did get a little emotional, because I knew she had been worrying much more than I had (partially due to the limited information she had about my condition). And it hurt to see Tim to nervous to come into the emergency room. A son shouldn't have to see his father like that. A few minutes later I realized that he wasn't nervous about me so much as the plethora of doctors and nurses bustling around the room. I was also grateful for my company being so supportive. My general manager and the president of the commission both came to the waiting room to see how I was doing. The manager came back again twice more while I was in the hospital. He told me that I hadn't done anything wrong, which I needed to hear. Before that, I'd been going over it in my head: "Why was I standing there? Which cabinet was it again? Should I have been somewhere else based on where we were in the switching?" But he assured me, that breaker had been closed in with no issues for several minutes. So there was no reason to think anything would happen. Overall, I saw a lot more things to be thankful for than to complain about: my family coming to my aid, especially my amazing wife, who has taken such good care of me; my friends and coworkers, who have come to visit, and brought me food and gift cards. Not to mention the obvious divine intervention: God, my guardian angel, St. Matthew - there was definitely somebody looking out for me that afternoon. And what's more, even though my hands and part of my face are bandaged up, I still have the use of my left thumb, index finger, and middle finger. Which is how I was able to type this blog post. Oh, and if you're not too squeamish, here are some more pictures of me and my burns.